While Angelo is painting walls and ceilings, I am painting the beach in Calabria. The beach shown above is at Tropea and the view is from above. It is quite a famous spot to take pictures. There are many on the intern if you google "Tropea beach" images. 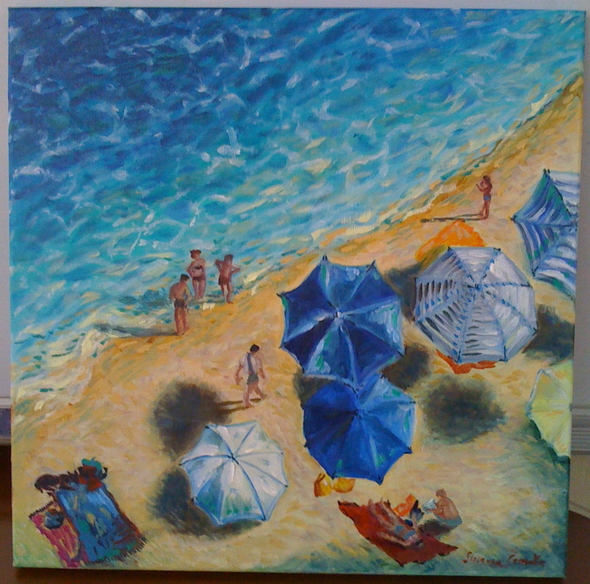 The motif I have chosen, however shows the Calabrian beach life best: colourful umbrellas, white sands and turquoise sea. And I wanted to try out water, colour and pattern. It was easier than I thought. If I would have known that my second oil painting turns out so nice, I would have painted on a bigger canvas. Now I have to do a second beach scene to hang a pair somewhere in our "beach palazzo". 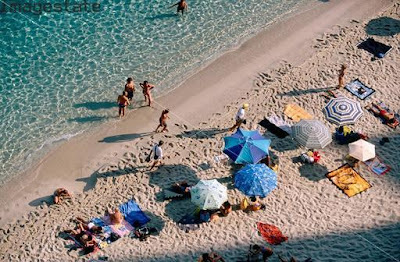 Tropea is just about 30 minutes drive from Pizzo. But Pizzo's beaches are nice too. 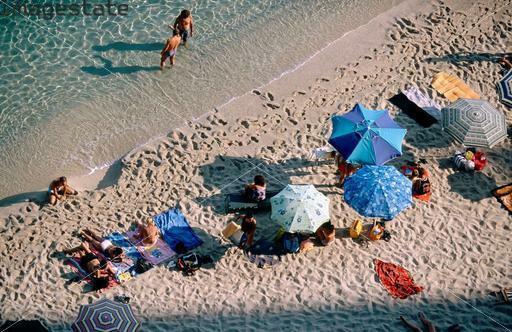 You even have the same perspective when you watch the beach at the Marina from the upper piazza. Funny, if these people would know that they are not only eternalized on photo, but now also in oil ?! Okay, one of the bigger guys I changed into a singorina...﻿ freedom of artist - and no royalties to pay to the photographer. My teacher and maestro also added a doggie since he felt something was missing in the lower left. Thanks to him, my painting looks so decent!